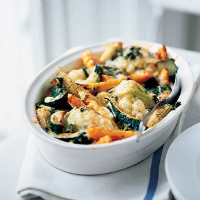 Serve this creamy gratin as a vegetarian main course with a tomato and red onion salad, or as a vegetable accompaniment to roast chicken or lamb. Preheat the oven to 200°C, gas mark 6. Add the cauliflower and carrots to a large pan of boiling water and simmer for 3-4 minutes. Add the baby corn and courgettes and simmer for a further 2 minutes. Drain thoroughly and transfer to a shallow ovenproof dish. Whisk the cream, milk, garlic and mixed herbs together and season. Pour the mixture over the vegetables, then sprinkle with the cheese. Bake for 20 minutes, until the cheese is golden and bubbling. Use 200g trimmed and halved baby courgettes instead of standard courgettes, if available.